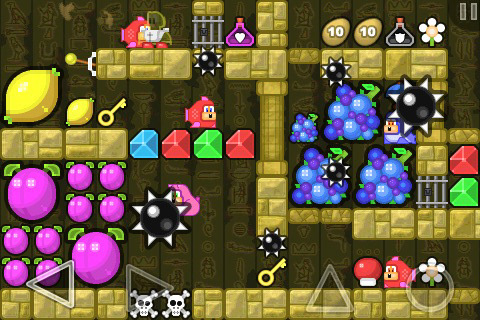 Last month we posted an exclusive look at the upcoming iPhone version of the ’90s classic puzzle / platformer Qwak, which started life on the BBC Micro and later came to the Amiga. We’re happy to report that the game has just gone live in the App Store [link]. In Qwak, you control a duck (get it?). Your objective is to guide this green duck through level after level of platforms, fruits and gems (worth points), bouncing enemies, power-ups to help demolish said enemies, and keys to unlock goodies as well as the level’s exit gate. Your duck can run, jump, and fire volleys of egg projectiles to knock out the baddies. Grab a bonus item and watch a hail of colorful fruit rain down upon you. Take too long on a level and meet a hail of spikeballs. In a nutshell, I call it frenetic, fun, and rather fruity (to be alliteratively wanton). I’ve spent some time with the prerelease build of the game that developer Jamie Woodhouse provided, and it’s been lovely to play. It’s a touch-controlled game with a left / right control in one corner and jump and egg-fire controls in the other. The vibrant visuals move about the screen as smooth as glass on the iPhone 3GS test device and a very Amiga-sounding score accompanies the action. It feels both retro and highly polished. It’s a game platformer fans won’t want to miss. See our previous article to read our interview with Qwak author Jamie Woodhouse. Next PostNext ‘Carcassonne’ Review — As Good As It Gets On The App Store?